This tutorial will provide the steps required to add a iCloud calendar feed subscription to your Táve account. In order to add a subscription to your iCloud calendar within your Táve account, you first need to find the custom URL assigned to your external calendar. Below are screenshots showing you how to find the URL for your iCloud calendar from both the Apple Calendar app and from iCloud.com. When viewing your calendars in the Apple Calendar app, click on the share icon that appears to the right of its name. You’ll see the following pop up appear on your screen. Here, you’ll want to check off the Public Calendar option, and then triple-click the URL generated beginning with webcal:// to select the URL in full and copy it (command+c on a Mac). Now, you’ll want to copy this URL and head on over to your Táve account to activate the subscription. When viewing your iCloud calendars from www.icloud.com, click on the share icon that appears to the right of its name. You’ll see the following pop up appear on your screen. Here, you’ll want to check off the Public Calendar option, and then select and copy the entire URL that appears below, beginning with webcal://. Now, head on over to your Táve account to activate the subscription using the instructions below. Once in your Táve account, you’re going to navigate to Settings › Calendar Feeds and choose the New Subscription button in the Calendar Subscriptions section. 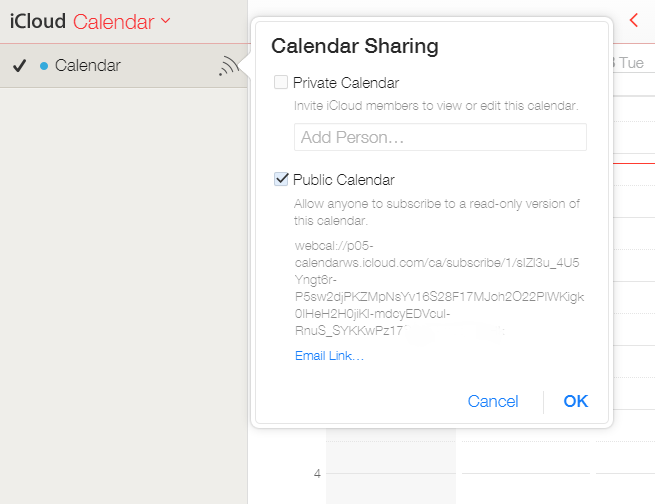 On this screen you will paste the URL you copied from your iCloud calendar settings in the URL feed. You can give your iCloud calendar a name of your choice, and select the color you’d like its events to display as in your Táve calendars. Your Táve account will shortly begin to fetch any changes to your newly subscribed calendar! You can always refer back to the Calendar Feeds page to see the current status of an external calendar subscription, including information on the last time Táve successfully fetched new data as well as any potential errors.